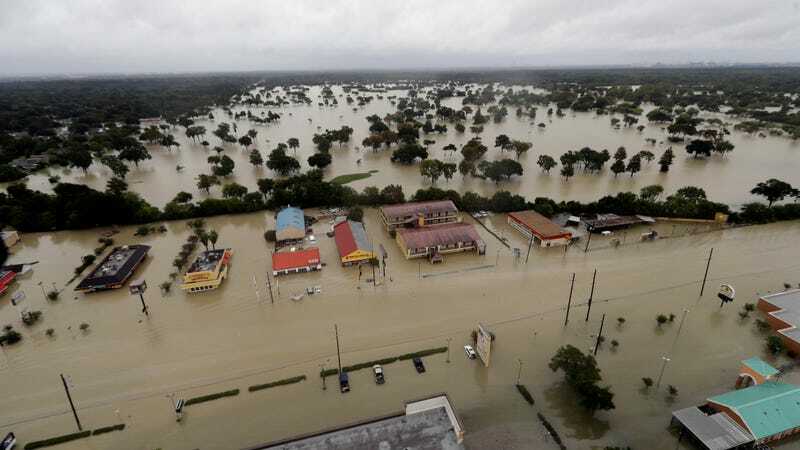 As Hurricane Harvey’s floodwaters begin to slowly recede from Houston, leaving behind at least 23 dead, residents and authorities alike are only beginning to assess the surreal extent of the damage throughout the region. That includes the country’s largest refining and petrochemical complex, which experts have warned for years would be a serious hazard if the area was hit by something like Harvey. It wasn’t just doomsaying. A flooded Arkema SA chemical plant in Crosby, Texas is almost certainly going to explode within six days, Arkema North America CEO Richard Rowe told CNBC, and staff have no ability to stop the detonation from occurring. Crosby is just over 24 miles northeast of downtown Houston. A satellite view of Arkema SA’s Crosby, Texas facility. Photo Courtesy ©2017 Google, Map Data ©2017 Google. We have lost primary power and two sources of emergency backup power. As a result, we have lost critical refrigeration of the materials on site that could now explode and cause a subsequent intense fire. The high water and lack of power leave us with no way to prevent it. We have evacuated our personnel for their own safety. The federal, state and local authorities were contacted a few days ago, and we are working very closely with them to manage this matter. They have ordered the surrounding community to be evacuated, too. Vice wrote the chemicals in question are the facility’s stockpile of organic peroxides, highly volatile substances used in the production of rubber and plastics. Organic peroxides were one of the materials used to craft bombs for ISIS attacks in Paris and Brussels, and need to be kept at a safe temperature or will catch fire and detonate. Rowe told CNBC remaining staff were evacuated on Tuesday, and the evacuation perimeter around the plant has been expanded to one-and-a-half miles. According to the Houston Chronicle, the facility was flagged in prior analyses by the paper and the O’Connor Process Safety Center as a potential risk to the surrounding region during an emergency. But Sam Mannan of Texas A&M University’s Mary Kay O’Connor Process Safety Center rebutted that point, telling the Chronicle Arkema SA could have neutralized the organic peroxides beforehand. “You’ll lose the feedstock, but it’s safer than letting it go into runaway mode,” Mannan said. “You get out and try not to be downwind,” an anonymous worker from a neighboring chemical plant told the Washington Post. Earlier this year, President Donald Trump proposed abolishing the US Chemical Safety & Hazard Investigation Board, a small federal agency responsible for investigating industrial accidents involving hazardous chemicals and passing those findings on to industries, regulators and safety officials. According to Chemical & Engineering News, White House budget documents for fiscal year 2018 suggested the agency’s mission of preventing industrial disasters was less important than deregulation. Update, August 31st, 7:41am: Two explosions were heard early this morning coming from an Arkema chemical plant around 2am local time. Black smoke could also be seen rising from the site, though reporters on the ground are 5 miles away. One deputy was sent to the hospital around 5am and nine others drove themselves. The sheriff contends that “it was not an explosion,” though the company has come under fire for not releasing information to the public about precisely what kind of chemicals the public is being exposed to.